Here I am wearing a T-shirt with the legend "Vírgen de las Vírgenes" (Virgin of the virgins) because it was December 12th, almost a national day, here in Mexico we celebrate the Virgen of Guadalupe on that day. Also this is the tittle of a song that was written by Mexican pop star Gloria Trevi. 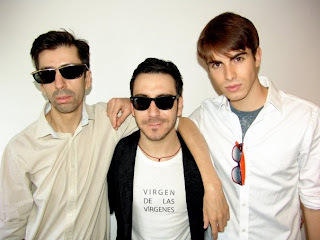 With me two dear friends, Mexican photographer and blogger Cesar Arellano and the sweetest model and person in the city: José. 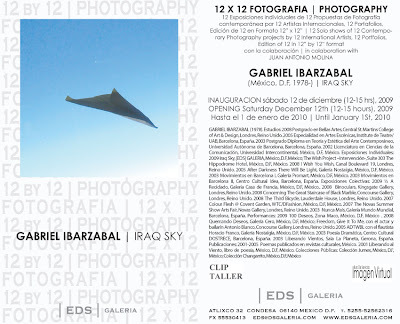 Con una formación multidisciplinaria, Gabriel Ibarzábal hace gala de una versatilidad muy coherente con el carácter mixto de las experiencias estéticas en el arte contemporáneo. Habiendo realizado estudios de ciencias de la comunicación, teoría del arte, performance y artes visuales, en diversas escuelas de México, Barcelona y Londres, este autor acude lo mismo a la pintura y el dibujo que al performance, la literatura y la fotografía, logrando en sus mejores proyectos esa pluralidad de lenguajes que suele enriquecer la naturaleza discursiva del arte actual. 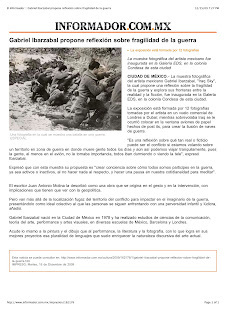 Su presencia en el proyecto 12 x 12 aporta entonces una interesante combinación de registro documental y narrativa ficcional, algo de lo que ya Ibarzábal ha sacado buen provecho en obras anteriores, como su serie 12 horas en Barcelona, de 2003. En Cielo de Irak los límites de lo específicamente fotográfico son rebasados con ironía y dramatismo. En esta obra no es tan importante lo que fue fotografiado como las circunstancias en que se generó y se realizó el acto fotográfico, circunstancias que también son reelaboradas por el propio artista. La obra consiste en una serie de fotos tomadas en un avión de pasajeros que volaba de Dubai a Londres, justo en el momento en que sobrevolaba el territorio de Iraq. Los aviones de papel aparecen superpuestos a la ventanilla del avión, sugiriendo la siluetas de los aviones de combate norteamericanos que participan en esa guerra. El montaje hace que la realidad de la guerra invada el microcosmos apacible de la cabina del avión, desde donde debería observarse un cielo prístino e incontaminado. Esas siluetas oscuras son amenazadoras y, al mismo tiempo, inofensivas, pues mientras la forma del avión remite a la realidad violenta de la guerra, su consistencia de papel nos deja con la tranquilidad de que estamos frente a una representación, a través de objetos que todavía conservan las connotaciones de los juegos infantiles. Esta doble connotación del avión de papel es equivalente al tono mixto (de refinada brutalidad por un lado, y de sofisticada irrealidad por el otro) que adquieren las representaciones de la guerra en los medios de comunicación contemporáneos. Iraq Sky es una obra que se origina en el gesto y en la intervención. Las fotos están impregnadas de la sensación de inestabilidad propia de las imágenes efímeras. Sus implicaciones tienen que ver con la geopolítica, pero van más allá de la localización fugaz del territorio del conflicto para impactar en el imaginario de la guerra, presentándolo como ideal colectivo al que nos seguimos enfrentando con una perversidad infantil y lúdicra. The multidisciplinary formation that characterizes Gabriel Ibarzábal displays a very coherent versatility with the mixed character of the aesthetic experiences in contemporary art. 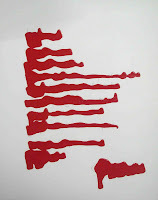 Having pursued studies of Communication Sciences, Art Theory, Performance and Visual Arts in several academies in Mexico, Barcelona and London, this author turns to painting in the same fashion he turns to drawing as well as to performance, literature and photography, achieving in his best projects, that plurality of languages that tends to enrich the stating nature of current art. 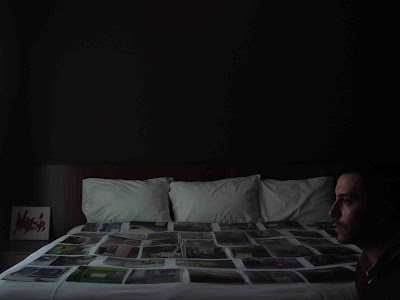 His presence in the 12 x 12 project thus contributes an interesting combination of documentary register and fictional narrative, something of which Ibarzábal has already benefited from in previous work, such as his series 12 hours in Barcelona,2003. In Irak Sky the limits of what is specifically photographic are surpassed with irony and drama. In this work what was photographed was not as important as the circumstances where the photographic act was generated and carried out; such circumstances are also re-elaborated by the artist himself. 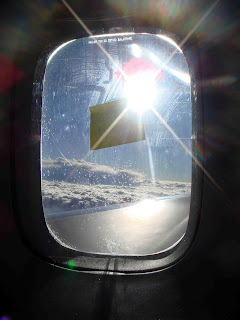 The work consists of a series of photographs taken from a passenger airplane that flew from Dubai to London, just at the time it was flying over the Irak territory. 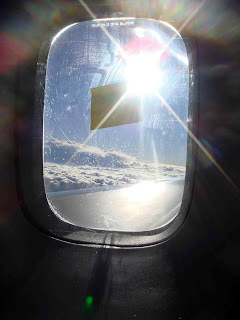 The paper planes appear overlapped on the airplane’s window, suggesting the silhouettes of American combat airplanes that participate in that war. 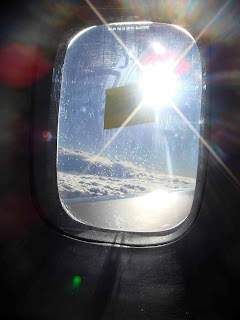 The assembly causes the reality of war to invade the peaceful micro cosmos of the airplane’s cabin, from where a pristine and unpolluted sky should be observed. 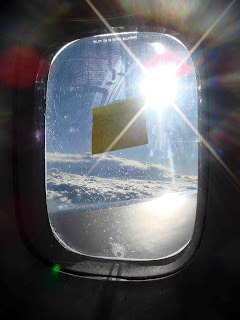 Those dark silhouettes are threatening, and at the same time, harmless, because while the airplane’s shape recalls the violent reality of war, its paper consistency leaves us with the calmness that we are before a representation, through objects that still keep the connotations of children games. This double connotation of the paper plane is equivalent to the mixed tone (of refined brutality on one side, and of sophisticated unreality on the other) acquired by the representations of war in contemporary means of communication. 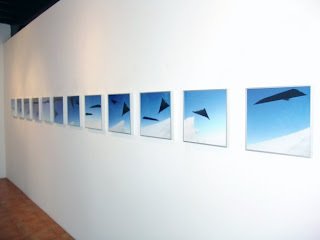 Iraq Sky is a work which is originated in gesture and in intervention. 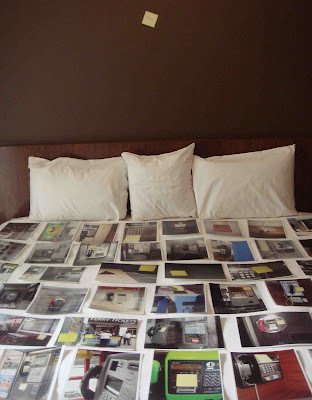 The photographs are impregnated with the sensation of instability which defines ephemeral images. Its implications are related to geopolitics, but they go beyond the fleeting location of the territory of conflict to have an impact on the imaginary aspect of war, presenting it as the collective ideal which we continue to face with a childish and ludicrous perversity. My first solo show as a photographer in this unique place: EDS Gallery... See you there. Next Saturday december 12th at 12 pm, Atlixco 32, Condesa, Mexico City. Over hundreds of visitors, a very smart selection of artists and pretty good energy on the air. 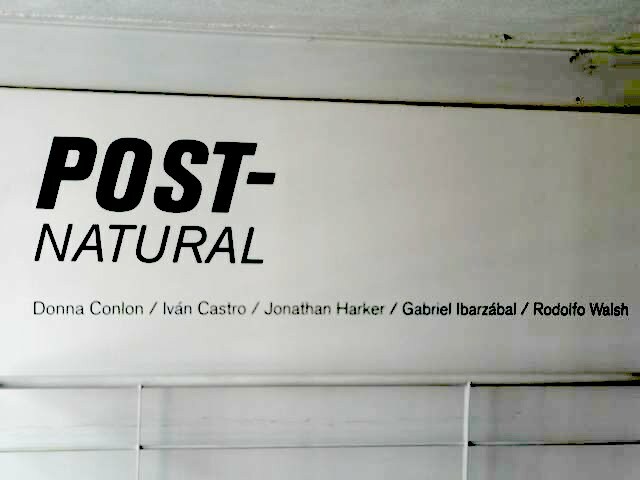 This was last December the 1st at the opening of Arte Pequeño in the Mexican Gallery Terreno Baldio, this group show will be on until January 30th. www.terrenobaldio.com Portrait by Mud Heredia. Photo by Jimena Oliver. And the people kept coming and going. 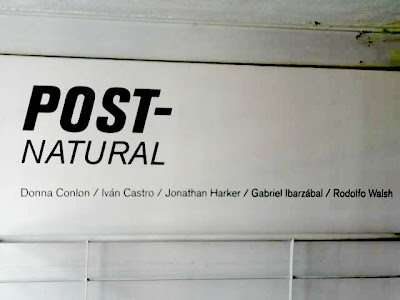 This is from an exhibition called Post-Natural curated by Emiliano Valdés. 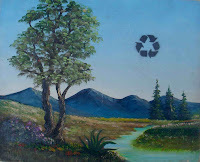 Which explores how art reflects the issues of todays society, and in this case, those that has to do with saving the planet and respecting nature. 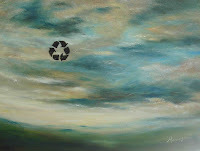 Here are three paintings from my series "Recycled Landscapes". This is taking part in the Centro Cultural España in Guatemala City. 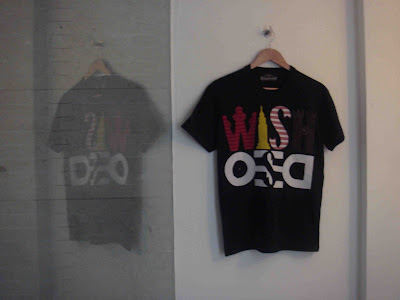 From my series of photos of The Wish Project by G.I. comes this image. 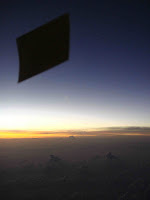 It was taken in a flight between London and Mexico City. And you can see two persons holding their hands in front of my piece. I created this pieces for my last group show. 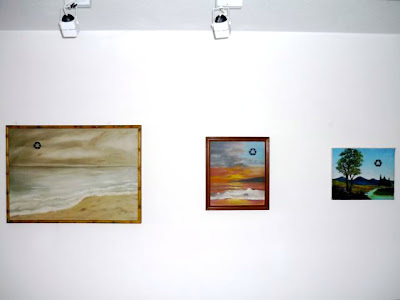 This are landscapes made of oil painting on canvas by unknown or amateur authors. 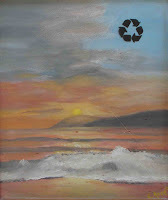 I found them on flee markets and I painted the sign of recycle on them. 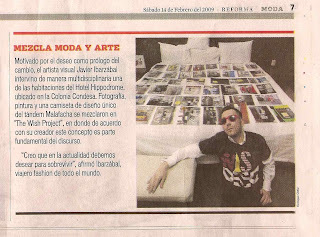 José Saenz is wearing the creation I made with Malafacha -Mexican brand-. I took this photo today at my studio in Mexico City and it is part of a series of portraits of young people making a wish/desiree. In this acrylic painting there are three wishes for London written with pencil. This was shown in a private view I had in Camden Town. During the last edition of Zsona Maco, the contemporary art fair in Mexico City, I gave 100 wishes to the visitors. With white cotton cordons used as bracelets. I asked them to close their eyes, make a wish while I did the knot of it. 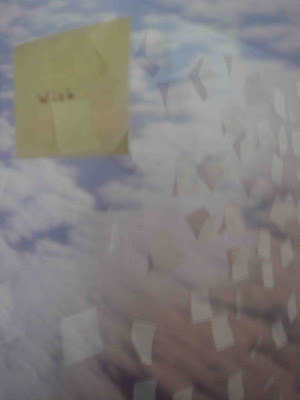 Then, I asked them that every time they see it try to remember/visualize that specific wish. Then, when it comes true they must give me back the cordon and I will do a piece with it. Today, one week and a half after the art fair, at least three persons have told me that what they wish now is a reality. Keep wishing! For the past 4 years I have been doing collective performances in different places. People is ask to write three wishes on a white paper, then in a circle we burn them while I ask them to visualized what they are wishing for. 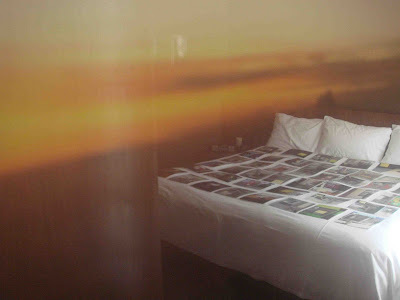 Then I ask for their email address and send them a photo with an abstract image created by me with that ashes. 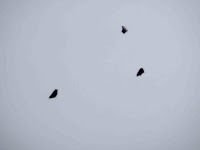 This image has the ashes of this performance which took place in Tepeji del Rio, Mexico few weeks ago. 2006, 2007, 2008 each year one photo in the plane. Flights between Mexico City and London. 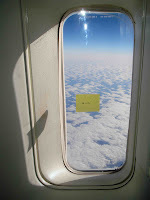 Making wishes on the air. Surviving. The light and the desire of wishing is related, is almost a metaphor. 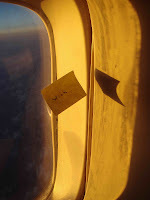 I took this photos in a commercial flight and in the post it is written Desea. 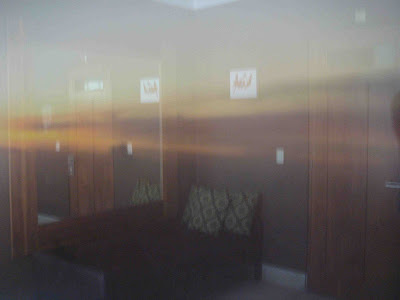 This is a series of photos I took from my intervention of the suite of the hotel all are reflections from the mirrors or the plastic of the frames or the place. At the opening of the show at the suite and while it last, everybody who attended was ask to write a wish for an stranger and not to signed it. 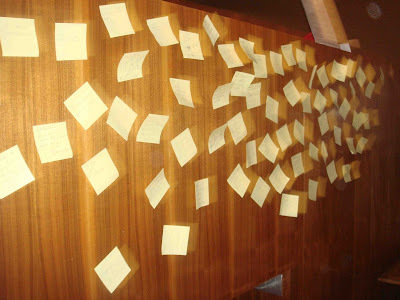 So there were dozens of wishes on the wooden wall on yellow post- its. The idea of participating the audience in any art show is important in my work. 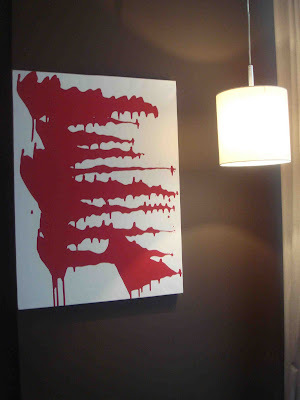 This is a painting that contains three wishes for the Gaza Strip, to both parts. One for the politicians, one for the soldiers and one for the civilians that have died. 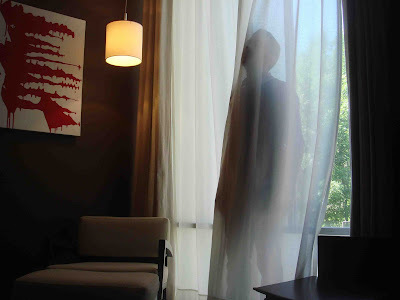 This was on the living room of the suite of the Hippodrome Hotel. Also I showed this piece that is a collaboration with the Mexican fashion brand Malafacha. 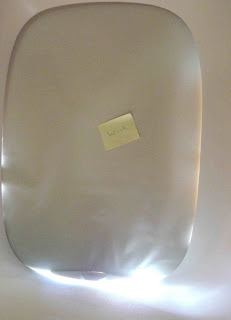 And it was displayed in the toilet of the suite. It is a unique piece and is cotton with lykra. 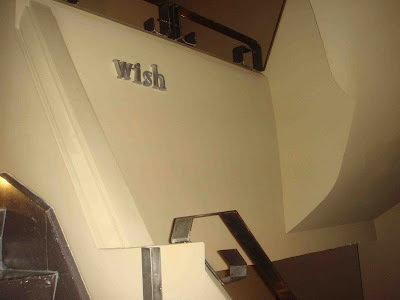 This is an article about my art work that is focus in promoting the act of wishing. Glow is a Mexican independent magazine that focuses on contemporary motivations, such as art and fashion.